This is National Suicide Prevention Week. Much will be said and written this week about suicide and how to prevent it. Most of it will not even mention the group at greatest risk of suicide: older men. Note: rates are per 100,000 population from CDC WISQARS system. The tragic recent death of Robin Williams at age 63 has brought attention to the dramatically increasing rates of suicide among the middle aged (45-64 years age group). 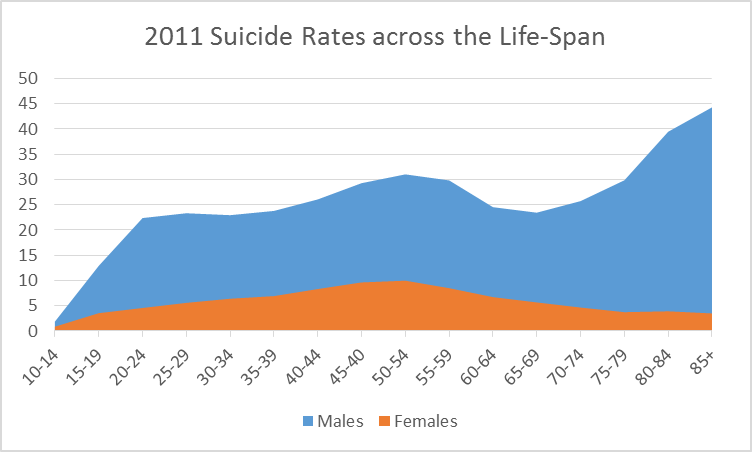 This increase in suicide rates among the middle aged is another reason to pay attention to the problem of suicide in older men (who have even higher rates). Researchers have long been predicting that the number of older adult suicides will increase along with the dramatic expansion of this age group due to the aging of Baby Boomers like Robin Williams. Even though it is well-established that older men are at the highest risk of suicide, you would not know that by looking at our official suicide prevention efforts. Most of the funding for suicide prevention programs in the U.S. is targeted to youth suicide prevention. There is a great need for suicide prevention in this age group, and this funding is laudable. But we also need funding for suicide prevention in older adults. Recently, the Substance Abuse and Mental Health Services Administration (SAMHSA) released a draft of its strategic plan for 2015-2018. One of the goals focused on prevention of suicide in high risk populations. Older men were not even mentioned. Is Late Life Suicide Understandable? Late life is not miserable for most people. Older adults are less likely than their younger counterparts to suffer from anxiety disorders, depression, and many other psychiatric disorders, and they display more positivity and report higher levels of well-being. Although it is true that physical health generally declines with age, the vast majority of older adults do not become suicidal when their health declines. Physical health problems are often part of the picture when an older man dies by suicide, but the types of illnesses might not be what you think. They are not all terminal or painful conditions. They include incontinence, poor vision and hearing problems. Cancer is a risk factor for suicide in late life, but research suggests that much of the risk is seen at the onset of the disease. This raises questions about adaptation to the diagnosis. Is that what happened to Robin Williams? According to news reports, his wife indicated that he had Parkinson’s disease, and that he had not yet come to terms with the idea of telling people about it. Could his suicide be related to difficulty adapting to the disease? So Why Do Some Older Men Die By Suicide? The most prominent risk factor for suicide in late life, as at other ages, is depression. Alcohol use disorders are also implicated. 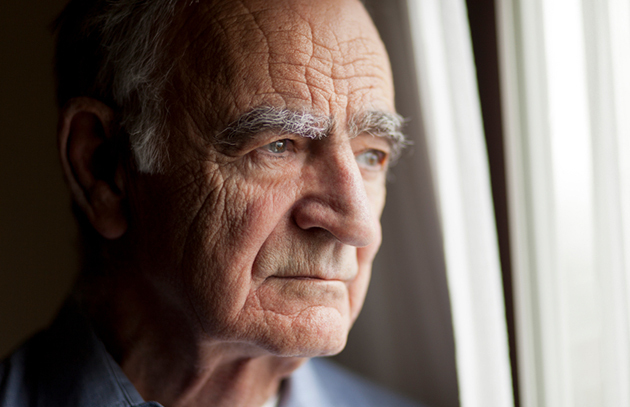 Depression is often undetected and untreated in older adults. Fortunately, some approaches to improving treatment of depression in older adults are effective. Medications and psychotherapy significantly reduce depressive symptoms. Interestingly, when given thorough descriptions of these treatments, older adults state a preference for receiving psychologically based treatments rather than medication. Suicide in older men is an important public health problem that can be prevented, but nobody seems to be noticing. We need to wake up and do something about it. National Suicide Prevention Week would be a great time to step up. Understand and explain to others that depression and suicide are not a normal part of aging. Know the warning signs for suicide and notice if older adults in your life are at risk. Take action if they are. Call the National Suicide Prevention Lifeline: 800-273-8255 or Friendship Line for the Elderly: 800-971-0016, an accredited national hotline/warmline that focuses specifically on older adults. Learn Read APA’s Depression and Suicide in Older Adults Resource Guide and the National Institute on Aging’s Age Page on Depression. Reblogged this on Counseling Insite.